Kirk was always fond of an M-18 Hellcat clone as the ultimate Belgian tank destroyer and I've finally gotten around to working up something. The result is a strange Cromwell, Hellcat cross-over with some additional features. I'd like a sanity check on the figures (I've not computed the power to weight ratio fully yet, but it seems very high. Under development in concept form since at least 1942, the T-22 evolved from a 60mm armed vehicle to a fast, lightly armoured 75mm vehicle to finally to a slightly larger design. In 1946 Cockerill began looking at using a standard A20 Cromwell chassis with a new open-topped turret with a 75mm gun but as design studies progressed the armour was pared back to that of the 1944 studies and a new torsion suspension fitted. Prototypes began mechanical testing in September 1946 and the first complete prototypes began Army trials during the summer of 1947. An order for 100 was placed in March 1947 and deliveries began in May 1948. The T-22B is a self-propelled gun variant of the basic T-22A but fitted with a different turret armed with the Dutch 105mm L20 M1945G howitzer as fitted to their SPGs. Prototypes began Army trials during the summer of 1948. An order for 55 was placed in March 1948 and deliveries began in May 1949. The T-22C is a utility tractor variant of the basic T-22A with the turret removed. The former turret space can be used to carry up to seven troops or the type can tow a field howitzer and gun crew. Mainly the type is meant for reconnaissance. An order for 115 was placed in March 1948 and deliveries began in March 1949. Under development as a private-venture by Cockerill, the T-22M series has a large flotation hull allowing amphibious use, being propelled by its tracks in the water. Two prototypes were built during 1948 and the company began a series of trials to find the optimum bow form and water propulsion. Two propellers were tried and abandoned, but two water rudders were found necessary. By February 1949 a finalised design was available for export. I don't have time to provide a full set of comments now (just leaving for the morning) but I will have some comments. My immediate feeling is that you might be trying to force too much onto the limited weight you have available. Okay, time now for my more detailed thoughts. T-22B: Is this an artillery piece with a turret, or a direct-fire infantry support vehicle? It's unclear to me... If it's the latter, only my weight comments from above apply. If it's an self-propelled artillery piece, the weight is low... and I don't believe there's a single period example of a turreted artillery piece of this sort. There are a number of SPGs of similar weights and calibers (for instance, the French have one based on their light tank hull) but they don't incorporate turrets. T-22MA / MB: When you say 'flotation hull', are you thinking something akin to the Type 2 Ka-Mi? Again, probably too lightweight for the size. I'm in general agreement with Brock's assessment of the design proposals and Belgium's needs. But I can offer some possible explanations. For the proposed T-22B, I think that it is meant to be something like the M52 SP Howitzer, which features a 105mm gun in a turreted mount. It is likely within the zone for appearance at this stage, but given Belgium's defensive stance, it does seem to go against doctrine. 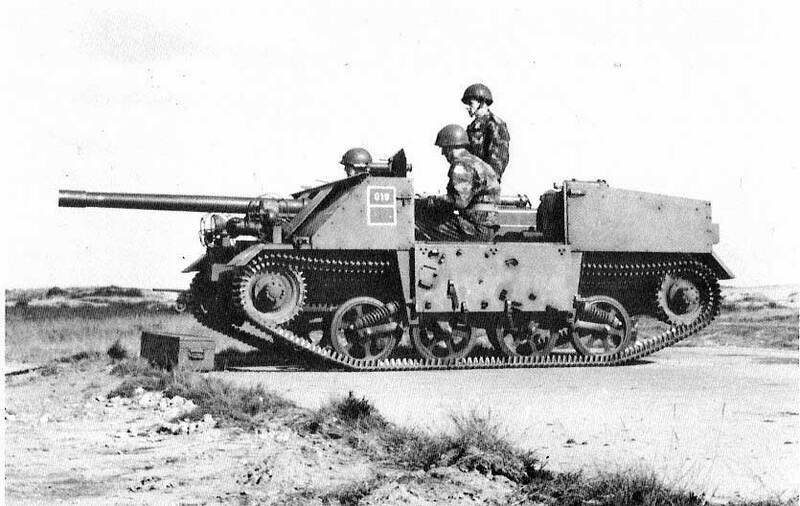 I think Brock's suggestion of a lightweight 'scoot and shoot' antitank vehicle has some merit; indeed, Belgium did field this sort of vehicle on the Loyd Carrier chassis in the immediate post-WW2 period, with a lightweight 90mm Mecar gun. There is a photo here. Alas the accompanying article looks to be in Russian. Oh yes, the CATI tank destroyer. I'd not thought of that one at the time I posted, but it's quite apropos for what I was actually thinking of. The T-22 family is based on the OTL M-18 family, including the experimental 105mm armed and M36 tractor versions and the amphibious version too (at work so don't have the M and E numbers to hand). When I say based on the Cromwell I meant the mechanicals more than the hull, and when I say mechanicals I mean engine and transmission, the Christie suspension being replaced by a torsion bar set-up with smaller road wheels and return rollers. I've taken the stats as the M-18 but added some weight for the bigger gun and engine (but perhaps not enough). A Charioteer conversion would be more straightforward but probably not the right choice I think. I forgot about the CATI, didn't realise the MECAR was this early in the post-war era. I know Belgium did develop some recoilless rifles but again I need to check details. So as a concept it might be better (Belgium's tank destroyers have all been pretty lightweight and thinly armoured anyway). I'll get some thoughts together at the weekend. As a historical firm, MECAR has been around since 1938; and recoilless rifles almost as long - so a 90mm MECAR RCL is not much of a stretch. The Oxford chassis, as Brock suggests, would even be a better choice than the Loyd - IMHO. Still not entirely sold on the concept of the amphibious tank project though - having to detach flotation chambers seems rather old fashioned, and I have to wonder which export market might be its niche. I've taken the stats as the M-18 but added some weight for the bigger gun and engine (but perhaps not enough). Well, the only M-18 stats as currently presented are the weights and speeds. The dimensions and engine are from the Cromwell, which is nearly 20% longer than the Hellcat, as well as being wider and a bit taller. The gun is also significantly larger than Hellcat's or Cromwell's - a 90mm gun rather than the 76.2mm or 77mm HV - so the armament weight probably increases by anywhere between 0.5 to 1 metric ton (over and above the supporting mounting structure, training mechanisms, etc). To some extent these two factors can be offset by the roof-less turret and the lessened armour, but I don't think it's enough in this case. I do really like the idea of developing the CATI, honestly - and you could probably snag a not-insignificant foreign upgrade market along the way, since IIRC there's a decent population of Loyd / Bren / Oxford Carriers already out there. It's not exactly a photogenic above-the-fold sort of design like the T-22, but I kinda feel it works well for the Belgians. It looks as if it would be a good defensive vehicle well able to fight from hull-down positions. Might be worth considering. I'd specifically avoided mentioning the Ikv-72 earlier in this thread since I've given some very serious consideration about cloning it. But since Bruce brought it up... :P yeah, the Ikv-72 was actually the vehicle I was thinking of when I first brought up the idea of the "hyper-light ambush sniper" earlier in this thread. Of course, the Ikv-72 is perhaps a bit less of a tank destroyer and more of an assault gun; the Swedish idea was to create an armoured vehicle cheap enough for widespread use by the entire army in order to provide armoured support to the infantry. Apparently some of the IKV variants did have an antitank role in mind - there are photos of at least one with a high velocity 90mm gun floating around. And different armaments could be fitted on the same chassis, like the StuG. That's true; and even if you didn't fit a high-velocity gun, you could probably develop a large HEAT round that could help cover the anti-tank role. I'd specifically avoided mentioning the Ikv-72 earlier in this thread since I've given some very serious consideration about cloning it. But since Bruce brought it up... yeah, the Ikv-72 was actually the vehicle I was thinking of when I first brought up the idea of the "hyper-light ambush sniper" earlier in this thread. your not the only one sir! Here is my take on the WW CATI. Also known as the CATI 90 (Canon antitank d'infanterie automoteur 90mm), a self-propelled gun based on the VUC-2, a licence-built Carrier Tracked No.2 Mk I Oxford. The CATI 90 uses a standard VUC-2 chassis but with a new upper body that mounts a Cockerill C 90 / L32 90mm anti-tank gun in the glacis. The sides of the open-topped body can be folded down to give the crew more room. The body is only lightly armoured. The CATI 90 is operated in teams of two vehicle, the gun carrier and an ammunition carrier based on the standard VUC-2. An order for 100 of each variant was placed in March 1947 and deliveries began in May 1949. And specs for the new gun (to be in vehicle and wheeled mounts). The need for a new light anti-tank gun was recognised in 1947 and development began of a new weapon. After trials during 1948 the first weapons entered service in 1949. I envision starting work soon on the following AT weapons soon too as OTL, ultimately I might replace the 90mm in the CATI with the 100mm RL-100 Blindicide in the 1950s. The RL-83 is an antitank rocket launcher produced by Mecar SA. Its name roughly means "tank killer", derived from the French "véhicule blindé" and the suffix -cide. The first prototypes began trials in 1950. It is operated by two men, one aiming the shoulder-fired launcher and the other as loader. The 83mm HEAT projectile weighs 1.6kg with a 0.5kg HE warhead. It began to be issued to Army units in 1951. The RL-100 is a 100mm calibre development of the RL-83, it entered service in 1953. The 100mm HEAT projectile weighs 2.75kg. Designed in 1949 by Edgar Brandt at Anstalt für die ENtwicklung von ERfindungen und Gewerblichen Anwendungen, based in Vaduz, Liechtenstein and manufactured by Mecar SA. Production began in 1950. The standard round is the 75mm HEAT-RFL-75 filled with 331g of RDX & TNT, it is propelled by a ballistite-filled blank cartridge. At the present time Edgar Brandt is still in France at the helm of Etablissements Brandt; didn't see anything in the news that indicated otherwise. The Blindicide looks interesting - it gives another potential "non-aligned" AT rocket manufacturer outside of the Great Powers. Worth keeping in mind for the next time any of my countries need to buy AT equipment. No problem, didn't know his background and didn't associate him with the Brandt company. No problems, we can probably work out a licence-deal whereby Mecar licence-builds the type from Brandt and we both get the new type. If not, I'll just settle for the RL series. I'd even be fine if you wanted to phrase it as a joint development between Brandt and Mecar; it's not like France and Belgium are enemies and I'd need to be concerned. :P IIRC France already has an AT rifle-grenade, but the ENERGA looks like a second-generation thing in comparison. The Heer might also be interested in the Energa 75mm AT hand grenade as an interim weapon. Presently its infantry antitank weapon is the 4m Panzerfaust 44, a licence-produced variant of the French LGPR-41AC 40mm recoilless antitank rifle. I ought to start documenting the next generation to succeed it, though battle experience is thin and the most recent combat scenarios – the Dutch operations in Ubangi-Chari – don’t give that much insight. But tank armor keeps getting thicker and the Heer would want some more oompf. I guess if anything the experiences in Ubangi-Shari would be close engagements, probably a bit like the Bocage fighting of June 1944. So close-in tank hunting might be the main threat and would influence the Belgians given the Ardennes terrain. That's true. Still, the relatively small number of armored vehicles involved and rather low loss-rate (from what I remember from the news) would suggest (to the Heer at least) that close-in encounters would be a lower threat. That opinion would change if someone somewhere ran into better trained opposition with far better weaponry.